Why is Alex asking a voiceover artist if he’s ever heard of Don LaFontaine? In response to my crush comment yesterday, a few people emailed me to point out that Julie has a reputation among the quiz bowl community. OK, I’m over it. Let’s get on to the situation – and it’s a good one. There’s some mind-game potential here, but Julie has proven so strong she will likely bet on herself. Arthur should wager to lock her out: 17,200. Julie, if she wants to play it safe, can wager up to 600 against Cesar. More likely, though, she’ll want to put up between 2,800 (to cover an unsafe wager by Arthur) and 15,800 (to stay above Arthur if he’s wrong). Ideally she’ll cap it at 3,400 to stay above a rational Cesar wager. 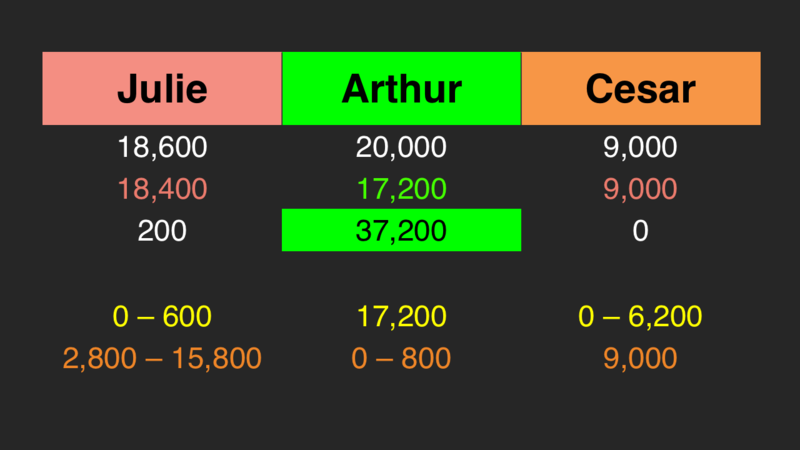 Cesar should wager no more than 6,200, to stay above Arthur. If he’s afraid Julie will play some tricks, he can wager everything. What?! Arthur went for the tie?! We could have a situation on our hands. Also of note: in Ken Jennings’s first game, he lead 20,000 – 18,600 heading into Final. (Third had 7,400.) 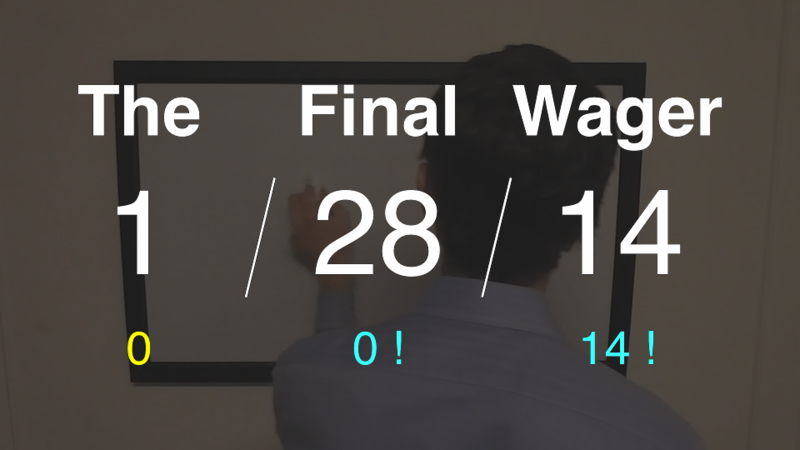 He did not wager for the tie. Correct response: What is the fountainhead? Awesome! Thanks for pointing this out, chase. In a world where Alex asks silly questions ….